Serial numbers assigned to "Milburn Light Electric" automobiles for model years 1915-1924. From Sandusky History Blogspot: "In 1921, L. C. Steavenson was the dealer for the Milburn Light Electric car at 1206 Decatur Street in Sandusky. In 1917, Mr. Steavenson worked at the Milburn Wagon Company in Toledo..."
Fitch was one of the most active of the Milburn dealerships in terms of not only regularly promoting Milburn Electrics exclusively (1921-1923), but also writing articles for the local newspapers that described the virtues of the Milburn. His articles and ads were the first confirmed written sources we had when we first discovered that the 1922 Models came out with a 5th speed---later this was confirmed by other sources including other ads, Automobile and AMPS v3n1. Starr also was one of the most active in regularly posting large display ads in the local papers for Milburn. The Fashion Auto Station and Electric Garage (740 E. 51st St. [also noted elsewhere as "4612 Cottage Grove St."], Chicago), with its large Milburn Light Electrics sign on its outside wall was a significant place for Milburn. 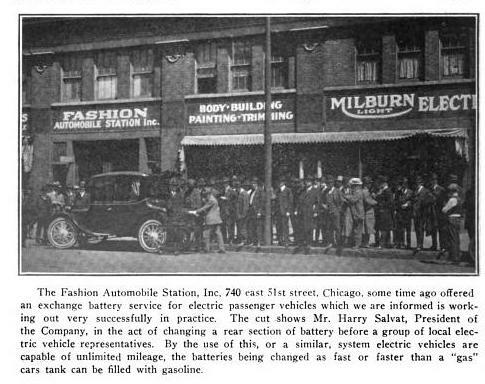 Evidence seems to indicate that the Fashion Station was the first to offer a battery lease program (1917 Electrical World, v69n2) whereby they'd sell new Milburns to customers without batteries for $1485 noting that they would have indefinite range by being able to drive in, swap out the packs in 5minutes and move on. As early as 1908, Fashion Auto Station had been involved with electrics exclusively, including electric buses. In 1916, Harry Salvat, owner of Fashion Auto Station wrote an extensive article in N.E.L.A. v39n4 entitled "Greater Garage Service" in which he outlines the challenges of the electric garage and even lists some 23 Chicago electric stations that had either switched to gas or gone out of business altogether. He laid a lot of blame on lack of coordination between the manufacturers of electric cars and batteries and dealers and stations. Mister Salvat is seen in this photo demonstrating Milburn's quick battery exchange system.